Do insects have hearts? The answer is no they don’t have hearts but they have their own version of heart which works to suit their less complicated bodies than the vertebrates. This question might have come into your mind maybe after squashing a roach under your feet and you are still wondering why is this thing still able to move? Its heart must have been crushed to bits. The reality is insects from an evolutionary point of view are not as complex as mammals like human beings. Who requires a very sophisticated heart comprised of various chambers able to deliver blood to different regions of the body. In comparison, insects have relatively simpler bodies and a simple beating or pulsating tube that does the trick for them. Insects have an open circulatory system, that means their bodies do not have a network of veins, arteries, and capillaries. In contrast, vertebrates such as human beings have closed circulatory system, we have a very sophisticated network of vessels that ensure transfer of blood to each cell. Insects have very small bodies consider a housefly which is less than a cm long and heart would be a luxury for it from an evolutionary point of view. Therefore, nature has designed the invertebrates or insect in a way that their bodies have a tube-like structure running along the body which beats to transfer the hemolymph in their body. Before reading about the heart lets get a little overview of what the heart beats around. Insects bodies are filled with a fluid called Hemolymph. This fluid is analogous to the blood in a human being and it contains all the hormones, nutrients carbohydrates, lipids, glycerol, amino acids, and other necessary things. Hemolymph is discussed in more detail below in the post. Like the backbone in vertebrates, insects have a tube running along the body from their head to bottom. This tube is composed of different chambers from the bottom to the mid part of the body. As soon as this tube reaches the thoracic part it becomes one continuous tube and leads towards the heads. How does the Heart Like structure work? This tube is continuously contracting and relaxing. As the tube relaxes in the lower part of the body the pressure inside the tube decreases which makes the hemolymph get inside the tube through the opening in the chambers. As it gets filled the insect tube contracts, this movement pushes the hemolymph towards the upper thoracic continuous tube region which leads to the head. So now the fluid reaches the head and then it goes back toward the other organs located inside the body of the insect. Once again the pressure inside the tube gets lowered and now the tube starts letting in the hemolymph again into the tube through the perforations/holes called ostia and the cycle of contraction and relaxations continuous. 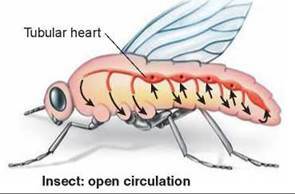 Another interesting point to note is that as the insect moves around the fluid inside also moves so that also helps in circulation of fluid in addition to the pulses of the tubular heart like structure. This was closely examined in case of a housefly and to the surprise of the scientists, it was found that in case of housefly the frequency was found to be 4 hertz. That means a housefly heart like tube beats 4 times in a second. This is quite fast considering the human heartbeat of 1.3-1.6/second. Surely in case of fly, it needs a lot of energy to move those wings. Another interesting thing which was discovered during the same experiment was that the beating process can work in reverse as well in some insects like in case of a housefly. This time the fluid comes inside the heart like a tube from the head region and by the contraction process, it gets released in the hind region of the body through ostia/perforations. The frequency of beats per second is 5 hertz which is one more than the forward pulse of the heart. So insect’s heart can beat both in forward and reverse direction in some species. Can Insects have heart attacks? So after getting the answer to the question Do Insects Have hearts. No, as mentioned insects have a heart like structures, not the heart itself. So they can’t have a heart attack. It’s something we mammals have to deal with only. In order to have a heart attack, there have to be some plaques or fat deposits in the arteries attached to the heart. In case, of the insects, these vessels are missing altogether so a heart attack possibility is completely ruled out. Have you ever squashed a cockroach and felt disgusted by the oozing yellowish greenish fluid? If yes, then you have seen the blood that is inside the Insect. It is called hemolymph. It contains 10% blood cell and rest is made up of plasma. 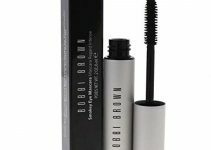 It is also responsible for fighting with the parasites that get inside the body of the insects. Its analogous to how the fighting mechanism is operated by the white blood cells in case of vertebrates like human beings. Occasionally people get confused that the blood color of the insect is red well that is not correct there can be pigments inside the insect from the food it ate or color of the organs in the gut that gets released with the fluid making it looking red. To conclude, insects have a system which works kind of works like a heart in a lesser sophisticated manner. The internal organs are just floating inside this fluid. Hemolymph supplies the nutrients, oxygen and picks up the unrequired material from these organs and helps in excretion. Additionally, the movement of insects also helps in moving the fluid inside the body cavity. So, locomotion and pulses of the tubular structure are working as a circulatory system of the insect.